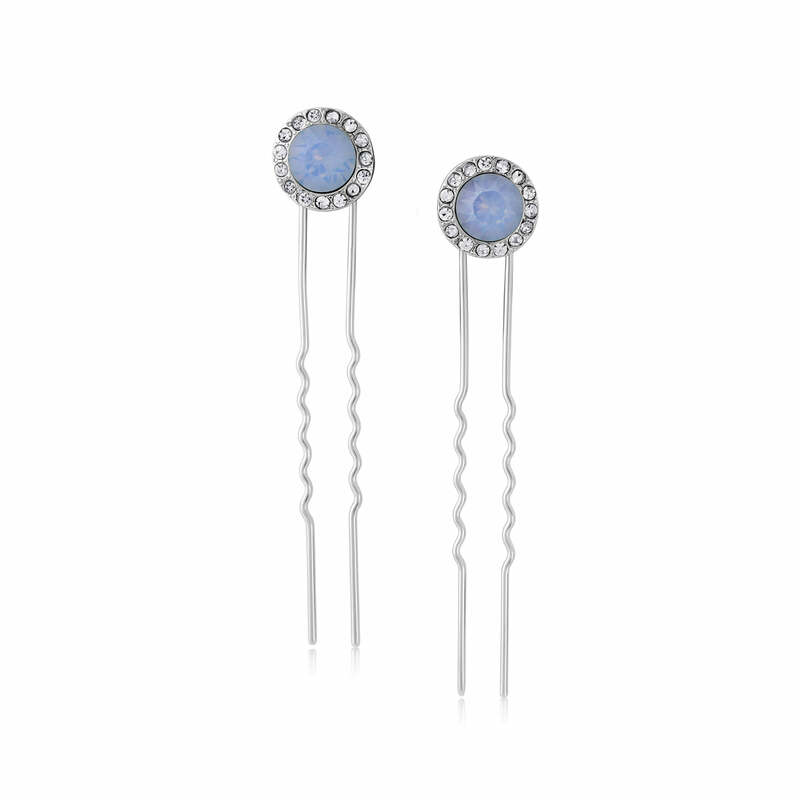 Add mesmerising sparkle to your up-do with these 1950's inspired blue opal crystal hair pins. Delightful drops of the most striking hue, our Shimmering Sky Hair Pins are adorned mesmerizing cornflower blue opal crystals encircled by sparkling clear Austrian crystals. Set on a double prong silver tone pin, this chic pair will dress your up-do with a burst of hypnotic colour. Inspired by hair accessories from the 1950s, Shimmering Sky flawlessly mix retro influences with an understated design that adheres perfectly to the much-adored ‘modern-vintage’ style. Pinned in an graceful pleat, feminine chignon or a quiff front rockabilly-esque up-do, these blue hair accessories will take your look from daytime chic to evening elegance. Brides looking for bridesmaid hair pins to complement a cornflower blue wedding theme will adore Shimmering Sky Hair Pins. With a coordinating jewellery collection, mix n match to your hearts content to create the most striking bridal party style and finish with a pretty bouquet of ribbon tied blooms.